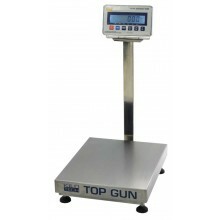 Weigh more service Weigh more selection TOP GUN Industrial Scales The flexibility of the Top Gun series allows you to select the KIN indicator suitable for your job, (ABS or IP67 equivalent Stainless Steel). Durable and multi-functional, these bench and platform scales are the preferred option for restaurant and Industrial applications. With a heavy-duty stainless steel platter and choice of mild steel or stainless steel frame, they ensure the reliability and precision needed to perform various demanding food weighing and industrial applications. Designed to provide accurate readings during weighing applications with a built in level indicator and lockable adjustable rubber leveling feet. An excellent choice for use in a dry environment and areas with low humidity.